Reaction Commerce | Aaron Judd poses the question: Why YAECP? Aaron Judd poses the question: Why YAECP? 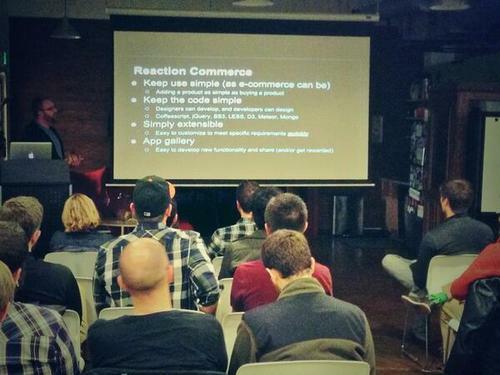 Last night at the LA Meteor Meetup at Coloft in Santa Monica, Reaction Commerce founder and CTO Aaron Judd presented to about 50 attendees and outlined exactly why the world needs Yet Another ECommerce Platform. He described the problems all administrators of ecommerce websites face, not the least of which is a process that isn't simple, intuitive or goal oriented. Then there's slow load times, hosting inadequacies and endless code hacks required to address performance issues. Add onto that the frustration developers often experience in trying to deal with aging technology, complex code and an abyss of maintenance, and what you get is an industry that’s largely a dinosaur in a rapidly evolving world. In short, today’s ecommerce isn't fun, isn’t current and isn’t real time. But now, thankfully, there’s Meteor, the new, powerful framework on which Reaction Commerce is being built. With Meteor, real time is the default. It's event driven using familiar, developer-friendly language, and it pushes changes not just quickly but automatically. Even better, Meteor already has an active community. After coding for 25 years using every cutting-edge and now-obsolete method available, Aaron enthusiastically proclaims that Meteor ranks as his favorite coding experience--which is why he chose it for his exciting, new venture. Reaction Commerce promises to "change the way you think about commerce" by removing the hurdles, frustrations and limitations of developers, designers, managers, clients and customers. Its Marketing First approach will allow businesses to avoid getting sucked into the black hole of the technology and instead focus on what they do best: sell products. And be sure to check out Why YAECP Part 2.